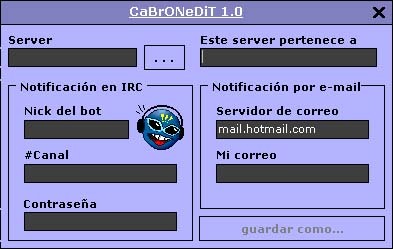 The author of the backdoor Cabrotor (aka Cabronator), the 26 years old spanish man Óscar López Hinarejos, has been convited to 2 years in jail. According to Spanish media La Vanguardia, this is the first case in which a virus writer is sentenced to jail in Spain. More infomation (only in spanish) is given in El Mundo and El Periódico. It is also possible to read about it from El Pais and La Vanguardia (both require registration). A description of the backdoor can be found here.